Welcome to EnglishNet, the EFL blog for Jaime Moniz students. 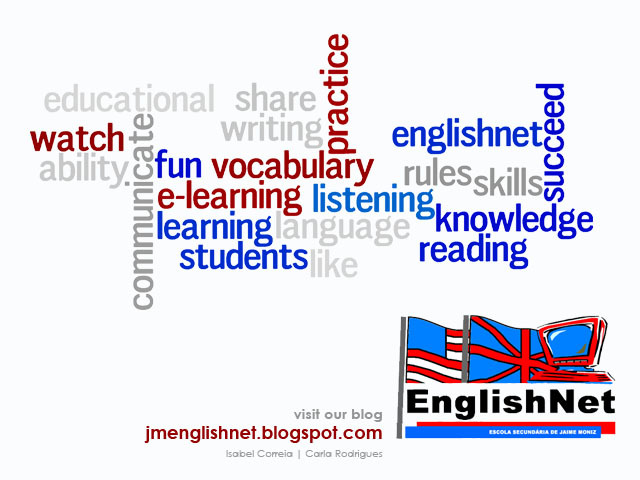 Here you have the opportunity to learn, practise and improve your English in a different way. You will also be able to participate and give opinions. The words "racecar", "kayak" and "level" are the same whether they are read left to right or right to left (palindromes). The most common vowel in English is "e" and the most common consonant is "r" followed by "t". The letter "q" is the least used. "Invisibility" is the only word in the English language which has one vowel, but this vowel occurs five times. I hope you enjoy and get the most of this blog! Those facts that you posted are really curious. Some of those words I have used them so many times, however I had never noticed on the things you said about them. I have visited this blogue so many times ago in the last school year and i have to say that it really helped me a lot as a way of study, specially for the compositions.Thanks teatcher and i hope that the blogue will help me a lot this year! Oh! by the way, nice facts! I'm happy to know that students will be able to use this blog once again and keep updated about the topics that are talked in the classroom. Thank you teacher for helping us through this blog and telling us these interesting facts! This blogue is a great form to help your students and entertain us with the culture stuff that you put like this facts. Olá prof, tem muitas cenas fixes aqui! olá professora, factos que nunca tinha reparado aqui..